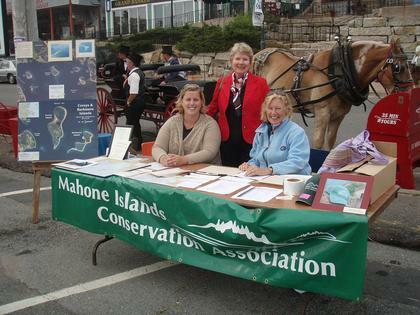 As part of MICA's ongoing outreach program, MICA Directors and Volunteers set up and hosted booths at local festivals in Mahone Bay and Lunenburg this summer. Our booths present information on island acquisitions, the current campaign, volunteer opportunities and membership, and MICA ball caps are always available for purchase. host the MICA booth at the Lunenburg Waterfront Seafood Festival September 12, 2009.